As Major League Baseball kicks off this year's season, the TorontoStar has just posted "The old ball game brings together Canadians of all stripes" where famous Canadian discuss the greatest game on Earth. The Time Machine Tour Kicks Off Wednesday, March 30th, in Ft. Lauderdale, Florida. I have created a Google iCalendar for the 2011 leg of the tour, showing all dates and local venue times (subject to change by the band, etc., although any changes should automatically sync with your calendar [may require a reload to re-synching]). You can link to this calendar using one of three options: xml, ical, html. With these options, you can add this to an RSS feed, import into Outlook, and add to your Google Calendar (to sync with your Smartphone!). Click here for help. 3. Under Add select "Add by URL". 4. Copy and paste the URL of the iCalendar file into the pop up window. The new calendar will now appear and is accessible from the My Calendars menu located on the left hand side of the screen. 1. In Outlook 2007 Go to the Tools menu and click on Account Settings. 2. Click on New from the Internet Calendar and enter the full iCal URL embedded above to the desired iCalendar file. 4. Type the name of the calendar as you want it to appear in Outlook in the Folder Name box (or use the default name) and then click OK. The calendar will be listed under "Other Calendars" with the name you chose (it does not merge with "My Calendar"). 2. Enter the full URL to the desired iCalendar file in the "Subscribe to:" box and click "Subscribe". 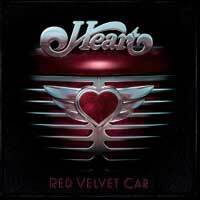 Nancy Wilson Talks About Geddy Lee's Credit On Heart's "Red Velvet Car"
Update: Last August 31st, Heart released their album Red Velvet Car. The album was produced and engineered by Ben Mink and David Leonard respectively, both of whom had the same credits on Geddy Lee's My Favorite Headache. "...an inside joke between Ben Mink and Nancy Wilson...Nancy heard some hi pitched thing in 'Death Valley' and Ben said 'it's probably Geddy whistling'. They gave Geddy credit. That's the story." - David Leonard, September 2010. 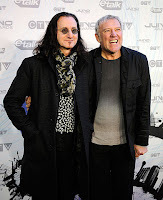 In addition, on Geddy Lee and Alex Lifeson were on hand to present the Album of the Year Juno to Arcade Fire for The Suburbs. Here is an audio clip of Geddy and Alex's presentation speech! - thanks to Shane Stevens for sending this recording! RUSH: Beyond The Lighted Stage premiered Saturday, April 24th, 2010, at the Tribeca Film Festival, winning the prestigious $25,000 Heineken Audience Award, was chosen as one of the Top 10 audience favorites at Toronto's Hot Docs festival, won the Golden Reel Award for best documentary, the Juno Music DVD of the Year and was nominated for the Best Long Form Music Video Grammy award. The film made its theatrical debut in Europe June 7th, and hit select theaters June 10th in the US and Canada, and premiered in the UK on November 1st accompanied by an exclusive Q&A with Geddy Lee, Scot McFadyen and Sam Dunn. The documentary was released on DVD and Blu-Ray June 29th. On September 1st, only two months after its retail release, Rush: Beyond the Lighted Stage was certified Double Platinum by the RIAA for 200,000 units sold (each 2 disk DVD package counts as two units, while the blu-ray edition counts as one). The DVD became the #2 best selling music video of 2010 with 118,000 copies sold in just 26 weeks according to YahooMusic. Rush was featured in today's UK Guardian Newspaper: "Rush: 'Our fans feel vindicated'" includes a brief biography of the last 37 years accompanied by recent comments from Geddy and Alex, and concludes with a retread of last fall's Guardian story where Neil discusses writing Xanadu. - Thanks to Reed Lover for the headsup! In celebration of the new Gibson Custom Shop Alex Lifeson Les Paul Axcess Guitar, enter for your chance to win the ultimate Alex Lifeson Concert Experience! The Grand Prize winner gets a pair of VIP tickets to see Rush live in Las Vegas, meet Alex, and take home a signed Gibson Alex Lifeson Axcess guitar. Musician's Friend will provide you and your guest with airfare, lodging, meals, local transportation, and premium concert seating in Las Vegas on June 24, 2011 The Grand Prize has an approximate cash value of $5,999.00. The winner will be selected in a random drawing on or around June 1, 2011. You're automatically entered every time you place an order with Musician's Friend between March 24, 2011, and May 31, 2011. No purchase necessary to enter." Click here to enter. - Thanks to Skip Daly for the headsup! "LickLibrary is proud to announce the launch of iDrum - the world’s first truly interactive magazine for drummers. 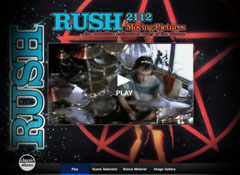 iDrum magazine is free of charge and contains news, reviews, lessons and hours of video content....The launch issue of iDrum features part one of an exclusive in-depth 40-minute video interview with Rush’s Neil Peart together with exclusive images from the current ‘Time Machine’ tour." For more information visit www.idrummag.com. Imagine living in a place where Rush was censored and certain songs were never released as they were deemed "controversial". 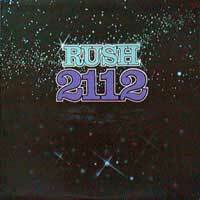 I was recently browsing the Japanese Rush fansite Diamonds In The Waste, and was surprised to see that the iconic red star was missing from the cover of the original Korean pressing of 2112. The red star is of course iconic of the flag of North Korea. According to SRO/Anthem, this was the Korean record label's decision and therefore out of their hands. In addition, I was told that on a related note "Tai Shan" was "dropped from some far eastern pressings" of Hold Your Fire. Delving into this further, Junya Suzuki from The Sphere pointed out that other Rush Korean releases have had similar changes due to their anti-establishment political views: "The Weapon" was dropped from Signals, "Red Lenses" was dropped from Grace Under Pressure and "Territories" was dropped from Power Windows. Surprisingly, "Witch Hunt" was apparently included on the Korean pressing of Moving Pictures, which is odd, as you would think that "those who know what's best for us" would protect their citizens from those dangerous Canadian views! As previously announced, Alex Lifeson is on the cover of the April 2011 issue of the Musicians Friend catalog to promote the all new Alex Lifeson Les Paul Axcess. In addition, they have launched an all new Alex Lifeson Les Paul Axcess page to promote the guitar, which also includes their five minute video with Alex where he talks about the guitar and treats us to some of his usual antics. - Thanks to RushIsABand for the headsup! Playlist For The Planet - includes "Second Nature"
"In celebration of David Suzuki's 75th Birthday on March 24, 2011, Playlist for the Planet, a compilation for environmental change, has been put together by the David Suzuki Foundation with proceeds going to The David Suzuki Foundation. Playlist for the Planet boasts some great Canadian artists, such as Randy Bachman, LIGHTS, k-os, Rush, etc, along with CBC Radio 3 contest winner Danny Michel, whose song 'Feather, Fur & Fin' was chosen by CBC Radio 3 as a source of inspiration to help our planet get healthy!" The album was released March 22nd in Canada, and will be available in the U.S. on March 29th. To order the album, click here; for more information, visit DavidSuzuki.org. - Thanks to RushFanForever for the headsup! Rush was mentioned on tonight's episode of Chuck: during "Chuck Versus the Muuurder", original airdate March 21, 2011, when interviewing potential new agents, Morgan asks a candidate "Quick. Rush's best album?" to which a nerdy candidate replies "Caress of Steel", much to Morgan's disappointment. You can view the episode in its entirety here. - Thanks to Jeff Lucas and Scott McBean for the headsup! This is the second episode to include Rush: during the episode "Chuck Versus Tom Sawyer", original air date October 27, 2008, Chuck must reach the final kill screen of the classic video game "Missile Command" to unlock the code to power down a satellite. As he prepares to play, he sees an R30 t-shirt, and realizes the game follows a pattern, the "music of the universe", which is of course "Tom Sawyer". As a companion to last year's "Classic Albums 2112 + Moving Pictures" documentary, Universal Music Group has launched a video-focused companion app for iPad users available for $6.99 download. As demonstrated by the screen captures in the itunes store, this app is the equivalent of the DVD documentary, rather than digital albums as some seem to believe. - Thanks to John @ Cygnus-X1.net for the headsup! Foo Fighters Acknowledge Rush Influence On "Rope"
Before it was even released, critics commented on how much the new Foo Fighter's single "Rope" sounded like Rush. 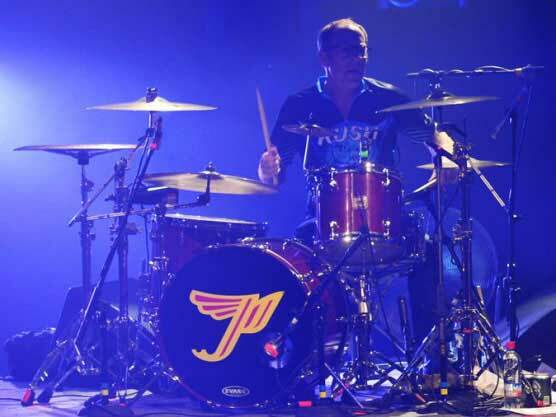 When interviewed by MTV, Taylor Hawkins stated that when approaching the drums on this record he "threw a Neil Peart [pronounced Pert] lick in" and goes on to say "I owe Neil Peart a lot of money for the chorus of 'Rope'. I'm splitting my royalties on that song with Neil Peart." - Thanks to Mike Lark for the headsup! Geddy came in at #12 on XM radio's "The Boneyard" Top 19 Best Voices of Rock Countdown. Counting down the top 3 were Axel Rose, Bon Scott and Ronnie James Dio at #1. - Thanks to Sniglets for the headsup! "Power Windows - A Tribute To Rush" is now on Facebook. Click here for the Facebook counterpart to the Power Windows website. It will include all the items posted on my News page, as well as additional Rush related postings and musings that I come across from time to time (which while interesting, might not exactly qualify as "Rush News"). Rare Rush Promo Photo From 1970! In a story published today regarding the Stayner Collegiate Institute's 50th reunion this May, SCI alumnus Jeff Parton reminisces hiring Rush for $250 in September 1970. The story also includes a rare promo photo of Rush from 1970. "A highlight for Parton while a student at SCI was the time Rush, the iconic Canadian rock band, performed at the school. Actually, they performed at the school twice. The first time was in September 1970 and then again in April 1971. "Music tutor by day and tribute band guitarist by night, Matt 'Lerxst' Johnston doesn’t have an enemy in the world...so he thinks. One night a pretty young woman tries to smother him in his sleep, and it’s not for the usual reasons a woman would have for wanting to inflict harm upon him! The dream he enjoyed at the time quickly spirals into a nightmare of mistaken identities and nosy investigators who threaten Lerxst’s freedom, to say nothing of coming close to discovering his grandmother’s secret 'herb garden.' Armed only with a guitar and endless questions, Lerxst escapes the discomfort of his beach home and hides out in New York City to learn the true identity of his would-be assailant. Instead he learns more about himself and what he needs to do to survive the next attempt on his life. 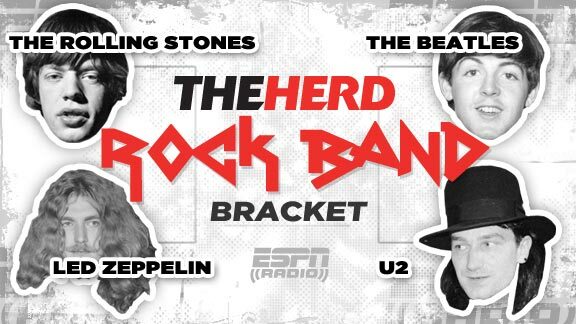 And what a long, strange trip it is..."
Rush On ESPN The Herd's "Rock Band Bracket"
ESPN radio's The Herd is running a Rock Band Bracket. After making it past Styx in round 1 of the midwest region, Rush lost to Metallic in round 2. Earlier this week, solid-state-logic.com uploaded a three part video interview with Kevin 'Caveman' Shirley. Early in the first part, Kevin tells the story how "when I was at the depths of despair and poverty I got a gig with Rush doing the Counterparts album." His story is not to be missed, you can view it here. - Thanks to squintyt4e for the headsup! "In 1978, when music found its way into Russ DiBella's life largely by way of external circumstances, a natural progression of sorts began to unfold which would eventually marry his affection for words with a nascent interest in drumming and lyric writing. What began as a teenage rite of passage - his first rock concert - would spawn a lifelong passion for all things music, manifesting itself in ways both deliberate and unanticipated. DW has introduced an exact replica of Neil Peart's "Time Machine" Collectible Snare; Guitar Center is now selling the snare for $999.00. - Thanks to Frank Ray for the headsup! Musician's Friend is offering a limted edition cymbal pack which includes a splash cymbal autographed by Neil Peart, with a portion of the proceeds benefiting littlekidsrock.org. 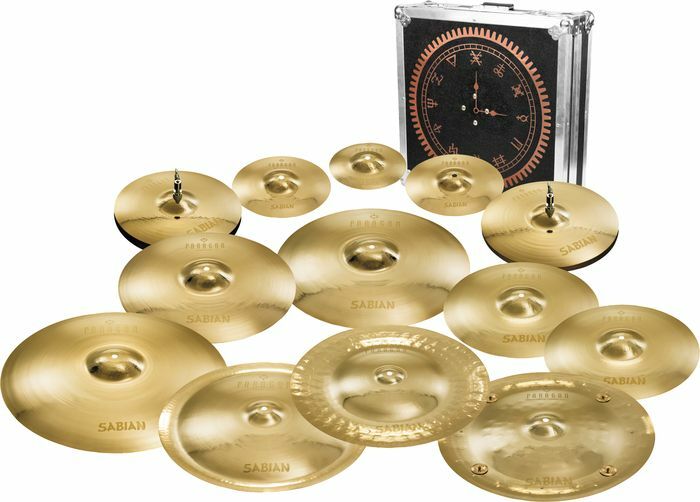 "The Neil Peart Paragon Complete Cymbal Pack comes with an 8" and two 10" splashes (including one to be autographed for you by Neil Peart), two 16" crashes, 18" crash, 20" crash, 22" ride, 19" and 20" Chinese, 20" Diamondback Chinese, and 13" and 14" hi-hat sets. Each cymbal features a brilliant finish. A portion of the proceeds from the sale of this pack will benefit Little Kids Rock, a nonprofit organization that transforms children's lives by restoring and revitalizing music education in our public schools. For more information, visit littlekidsrock.org." 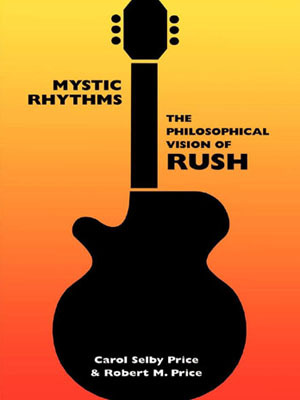 Dr. Robert M. Price, co-author of Mystic Rhythms: The Philosophical Vision of Rush, was recently interviewed by the Michigan Skeptics Association to discuss the music and lyrics with Rush. The interview is available as a free podcast, click here for more.